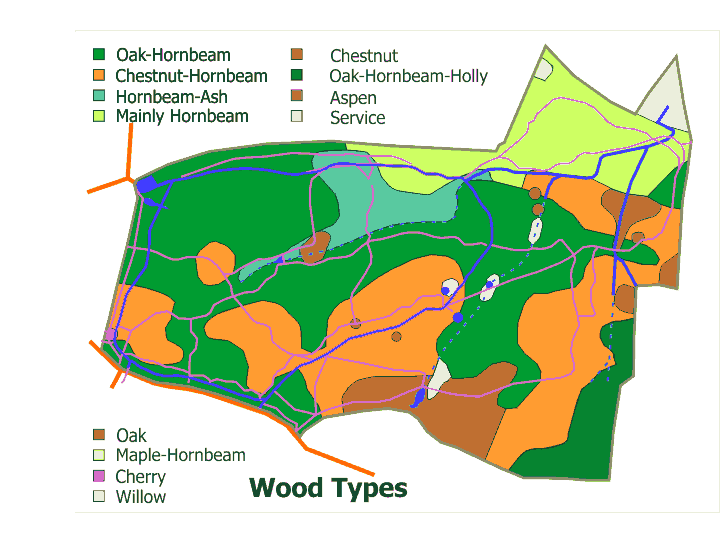 This page provides a series of maps of Pound Wood. They are mostly redrawn from maps in Rackham’s (1986) book, augmented by more recent information on the wood. 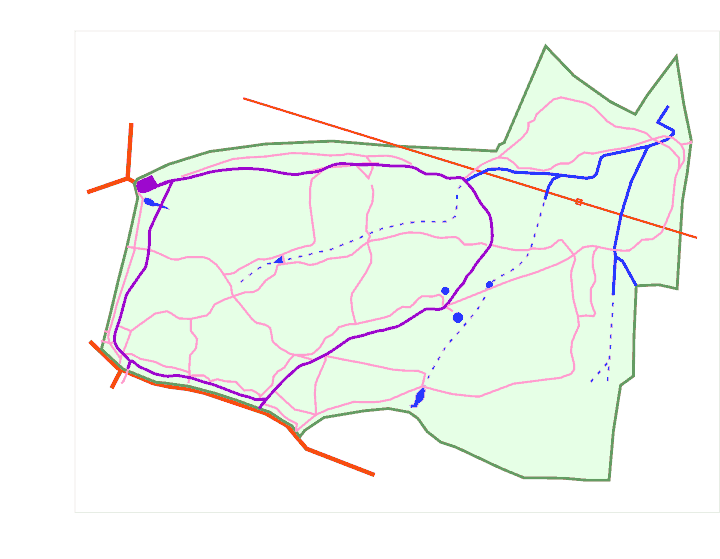 These provide a series of maps of the paths, rides, brooks, coupes, geology etc. They are each provided as a PNG image on the webpage here, and as a downloadable PDF files that can be printed to scale. You can, of course, download the PNG file, but this is of a fixed size (720px wide) and is not very scaleable. These are currently very much work in progress. Any comments, please contact me. Details are on the About page. 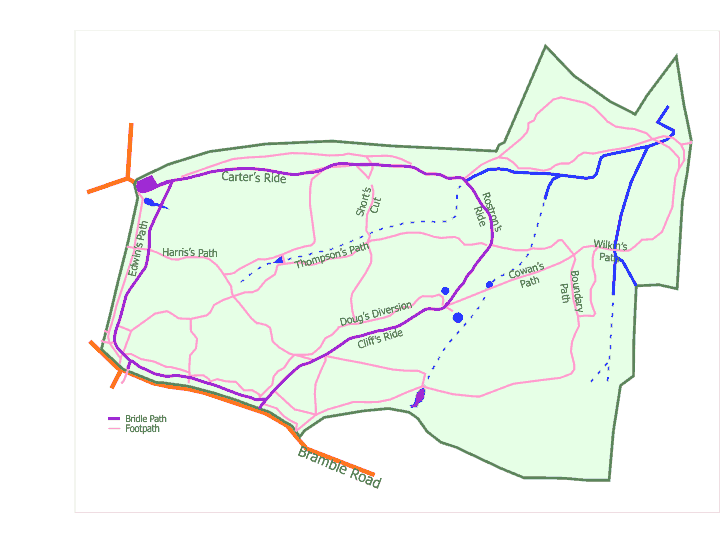 Note that in most of these maps, I have included the (un-named) bridle path, footpaths and streams to give an indication of positioning. There are brief notes given with each of the maps. To download maps as Portable Document Files (pdf) or Enhanced Metafile (emf), see the end of each section. 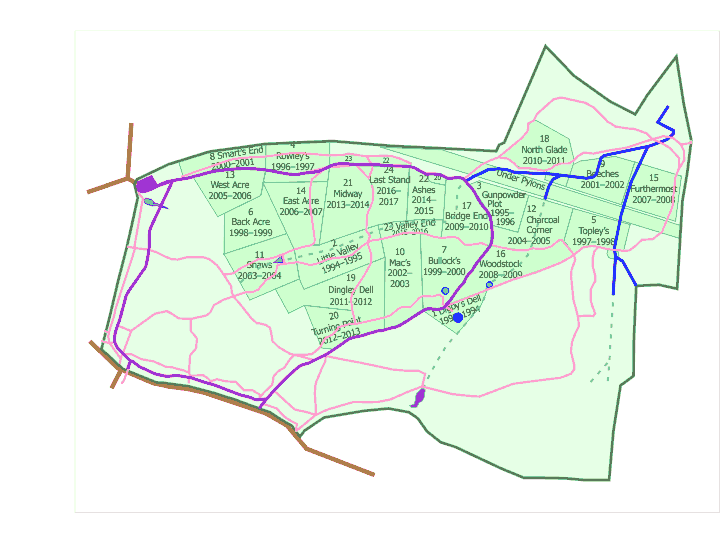 This map simply shows the wood outline, together with the bridleways, footpaths and streams, but with no names. It also shows the route of the electricity pylons. 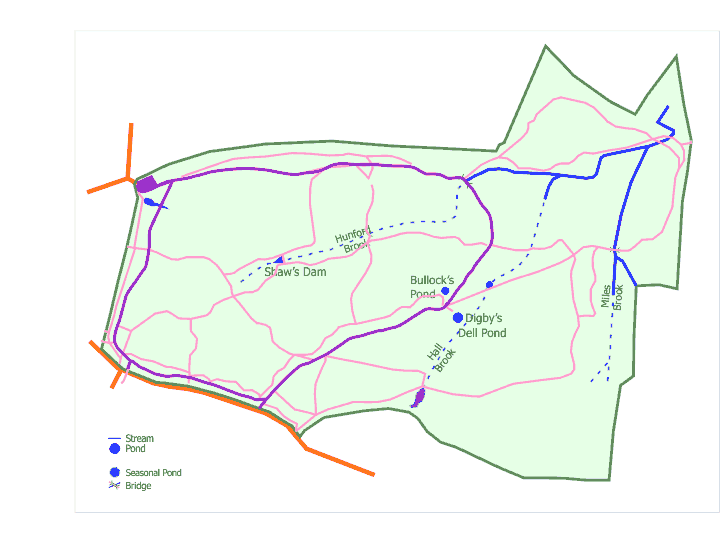 The Bridleways and Footpaths are mainly named after various people who have either hepled in the acquisition of the wood or been involved in its management. The Streams (Brooks) are mainly named after various people who have either hepled in the acquisition of the wood or been involved in its management. The coppiced areas are shown in yellow-green. Further information about each coupe is available through the Coupes page of the Pound Wood Site. 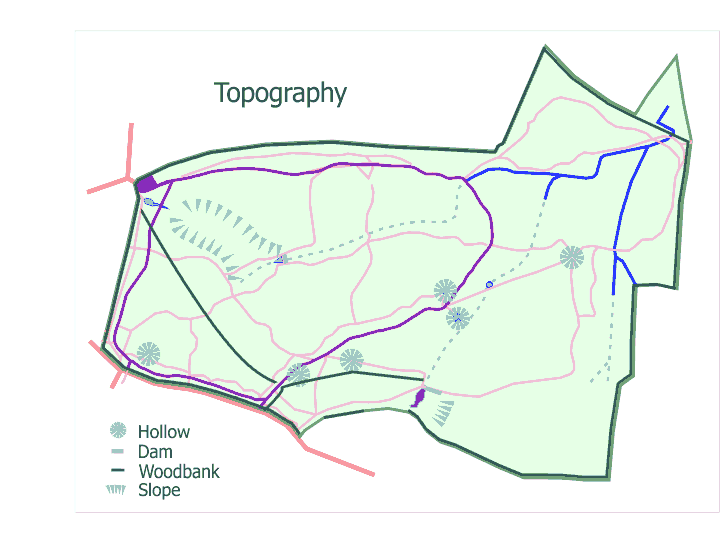 This map shows the major topographical features of Pound Wood, including woodbanks, streams, hollows and significant gradients. It should be seen in relation to the other maps since the outlines are not shown. Woodbanks are the markers for ancient boundaried between ownerships. They are explained in the History page. The origin of the various hollows in the wood are unclear. They may be the remains of digging to extract gravel. It has been suggested that the two hollows near the centre of the wood are WW II bomb craters. Slopes are indicated where the topography is greater than the overall gentle slope of the wood. The various colours correspond to major woodland types. Small patches of individual trees are represented as circles. The three strata of underlying rock are approximately separated by the 50m and 60m contours. 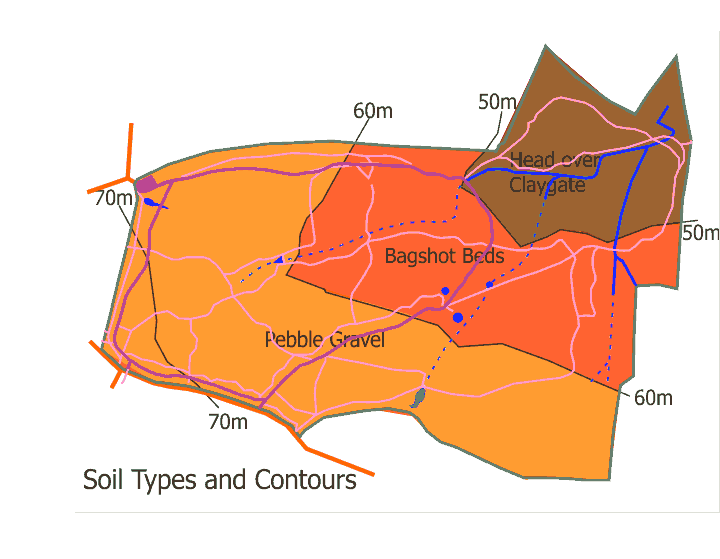 The lower levels, especially the Claygate beds, are overlain by ‘Head’ which is a mix of the Pebble Gravel and Bagshot deposits that has been eroded down to that level. The entire wood area has since been covered by a 1–2m layer of Loess, a fine silty, windblown deposit. The link at the end of each section above allows you to download a Portable Document File (pdf) or an Extended MetaFile (emf) of the maps, suitable for printing or incorporating into word-processed reports, by right-clicking on the highlighted map name below, then selecting the Save Link As option (or the equivalent in your browser). Depending on your computer, it may also open the map in your default pdf reader. Which version is best will depend on your computer and your word processor. I find that, using Word under Windows, that the EMF files are more flexible. Note: If you wish to re-scale these maps in a document, then you should always use the corner handles to adjust the size. This will preserve the aspect ratio and avoid distortion. Rackham, O. (1986) The Ancient Woodlands of England: The Woods of South-East Essex. Rochford District Council.